Let’s keep this holiday goodie train chuggin’ along, with a new cookie recipe that I made recently for a holiday get together. It’s inspired by the Turtles candy, with a nutty, “buttery” base of toasted pecans, caramel-like Medjool dates, and mini dark chocolate chips. They did not last long. I bet you’ve never had an oatmeal cookie quite like this one – it’s a keeper, for sure! I have to say, it replaces my oatmeal raisin cookies as the new reigning champion. And I didn’t think anything could top those. The cookies aren’t too shabby either! My favourite way to eat them is straight from the fridge or freezer. Weird, right? They get really firm and crispy when chilled – almost caramelized in texture – and I just can’t get enough. I’m so sorry to do this to you, but I’m keeping the recipe a secret. Sometimes I just want to keep a recipe all to myself. Is that wrong? Ok, ok stop punching your computer screen. I’m only joking! Poor computer screen. For the full recipe, head on over to Keepin’ It Kind where I’m participating in Kristy’s Vegan Cookie Swap Party. Inspired by one of my childhood favourite candies, these "Turtle" Oatmeal Cookies are studded with caramel-like Medjool dates and dark chocolate chips, all surrounded with a nutty toasted pecan and oat base. If you can stop eating the dough for long enough to bake them, you are in for a real treat. This sounds a bit strange, but my favourite way to enjoy these is straight from the fridge or freezer where the cookies get firm and crisp. Preheat oven to 325F and line a baking sheet with parchment paper. Toast pecans for about 9-11 minutes, until golden and fragrant. After toasting, remove from oven and cool for a few minutes. Preheat the oven to 350F. Add pecans into food processor along with 1 cup of oats and process until coarsely chopped with some fine powder (see photo in blog post). Be sure not to over process or the oils in the nuts will release. In a large bowl, stir the pecan/oat mixture, the remaining 1 cup rolled oats, flour, Sucanat, baking soda, cinnamon, and salt. In a medium bowl, stir together the maple syrup, melted coconut oil, milk, and vanilla. Pour the wet mixture on the dry ingredients and stir until combined. In a small bowl, coat the chopped dates in 1/2-1 teaspoon of flour and toss until coated. This prevents the dates from sticking together. Fold the dates and chocolate chips into the dough. Take about 2 tablespoons of dough, roll it into a ball, and then press down on it with your hand to flatten it on the baking sheet. Space cookies a couple inches apart. Repeat until you have about 16 cookies. Bake for 12-13 minutes at 350F until the cookies are golden brown on the bottom. Remove from oven and let sit on baking sheet for 3-4 mins before placing cookies onto a cooling rack for 15 minutes. Notes: 1) Instead of gluten-free all-purpose flour, you can probably swap it for regular all-purpose flour. Depending on the flour you use, the results can vary. 2) As for the gluten-free flour blend, I recommend using one that is rice based (such as Pamela's brand) and avoid using one that is garbanzo based (such as Bob's Red Mill) to avoid any bean-y flavour. Oh my, STOP IT!! These will be my waistline’s sole destroyer this holiday; so worth it! LOL..my work here is done. jk. I agree there is never such a thing as too many cookies! I used to LOVE turtles! I want to make this TODAY! omgoodness!!! I LOVE your piglet avatar!!!!!!!!!!! Thank you for sharing this recipe! Every time I make anything with oatmeal it just never comes out right. It’s either soggy or rock hard! But I’ll keep trying though! Yum, these look delicious! Heading over to check out the recipe now! Would these still do well without the dates? Sorry, but chewy things in my cookies interrupt the crunchy goodness. They look good. These look sooo delicious! Thank goodness you aren’t really keeping the recipe to yourself :) Any cookie with oats + nuts + chocolate is a winner in my book! Thanks for so many great recipes! I’m not sure if they would hold together using just almond flour. I would think you’d need a gluten-based flour OR the GF all-purpose for ideal binding properties. I could be wrong though! So glad it worked out! thanks for letting me know. haha! Thanks for sharing. These sound fantastic! Phew, I almost yelled NOOO at the screen before realising you did in fact share the recipe. :) The photos look so good, makes you feel like you can grab the cookies off the computer screen. I was like “WHAT? !” when you said you weren’t going to share the recipe, oh heck no! Love Kristy’s cookie swap! Oh my! These are so tasty sounding. Yum! Hey there Angela, I was at WF today pounding back some Kombucha as I turned the corner in the store what did I see Not your book but it would have been cool if it was PROUDLY sittiing on the shelves of WF or Trader Joes, Sunflower/Sprouts market or In Canadas NAtural Health Food Stores. I hope one day I can go into WF and buy your book and heck Id pick up a case of Glo Bars too… Just sayin !Happy Holidays You!!! Oh, no. I could never stop eating turtles when these were around. This has danger written all over it…. Very funny! 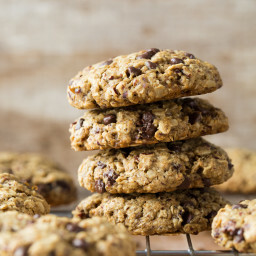 In my mind, I was thinking of your Ultimate Oatmeal Cookie recipe, and what changes would need to be made to make these.. glad I won’t have to guess! I just made these for a fellowship on Saturday and they are fantastic. I already know they will not last until then in my house. Also, thanks for the warning about eating the dough … it’s addictive. Oh my….. screw the baking, I’ll just have the dough please! :) These look ridiculously good. Fun fact: When I was a kid, I loved eating frozen cookies too. My mum would freeze batches of oatmeal cookies (I’m assuming it was so that we wouldn’t eat them as fast), but that never stopped me. Must be an Angela quirk lol! Do you think an oat flour would work? I don’t have any gluten-free flour on hand and I’d love to keep them gluten free! I made turtle oatmeal cookies today and they’re to die for, but definitely not as nutritious as yours – mine are an old family recipe with lots of butter, white sugar, and eggs. I’ll have to try these out for a less sinful alternative. We’ll see how the family likes them! I also wonder about a flour swap, using spelt in place of the GF flour. I live in a very remote area and good GF flour isn’t really available but I want to make these to bring to my wheat sensitive sister for Christmas and spelt flour is what we have up here. Would you please be able to help me out with a substitution, how much should I use? Did you ever make these with the spelt flour? Also don’t have GF on hand and wanted to try with spelt… would love to hear if it worked out. 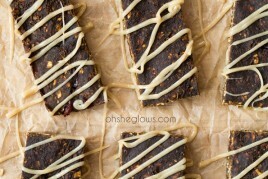 these look great … I’m wondering about substituting brown rice syrup for the maple syrup. It’s a much thicker, treacly consistency … but it’s what I have on hand, and we like to use what we have on hand. 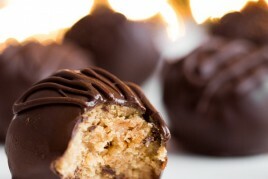 I also use brown rice syrup in my bijou peanut butter cups, which thickens the mixture like maple syrup does. Thanks for the recipe! I love cookies (and just about anything else) straight from the freezer. Years ago – before I saw the light (haha) – I left a box of Pop Tarts in my car in the winter, and my love of frozen pastries was born! Ang, I made these this morning as a gift for a few friends. Holy moly they are delicious! I used coconut sugar in place of the sucanat and my own blend of gf flour, but kept everything else the same. It took so much will power not to drink the ‘wet’ ingredients before adding to the dry. Oh, and once you add the two mixtures, it was like toffee caramel heaven. My husband (who is VERY picky) stated that he would have no problem just eating the dough because it was SO good. I agree! Thanks! I would eat the batter by the spoonful! Thank you Angela for that wonderful recipe :) Can’t wait to try it. I have a quick question though. I only have the Bob’s Mill gluten-free all-purpose flour mix at home. I don’t have access to the Pamela’s Brand in my region. So, I’m wondering if you have a homemade gluten-free all-purpose mix recipe to suggest me ? I pretty have most of all the gluten-free flour here, so I can definitely make an interesting mix. However, I don’t know which one to use and in what proportion. I would really appreciate if you can help me with this one :) Thanks in advance and have a nice weekend. I used the Bob’s Red Mill because it was all I had and they turned out delicious. Not beany! O.M.G.! I just made these. Best. Cookies. Ever! Amazing! Only thing I did was to make them half the size so I have more of them. I’ve baked them to take to my office on Monday, but they may not make it. Or I just have to bake another batch….. seriously fabulous!!!!!! Just made these for my sister who is gluten-free and visiting for Christmas. So delicious! Even my very picky husband couldn’t get enough! 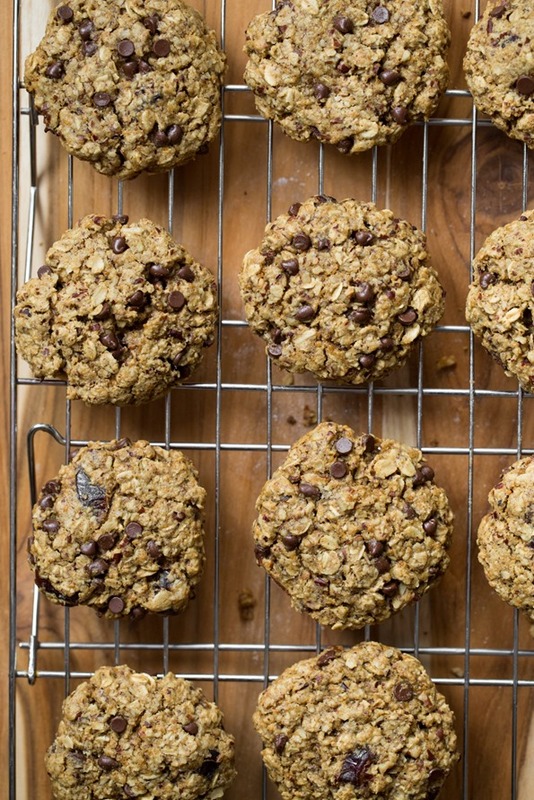 Made these… they were good but have to admit, your Oatmeal Choc Chip are a lot better. :) But it was a nice change with the dates and less work to make them. I was wondering if you have seen this website before and your thoughts on other butter replacements to use. OMG best cookies ever! Thank you! I made a couple of changes to mine based on what I had on had. 1. I used spelt flour. Not technically GF but my son is GF sensitive and can tolerate Spelt. 2. I used coconut sugar instead of succulent. 3. Instead of mini chips (Whole Foods was sold out!) I used the larger dark chocolate disk shape chips. I would recommend more chopped dates in the recipe as I couldn’t really taste them in the cookies. These look fabulous, can’t wait to try them. Was wondering if there is a replacement for the coconut oil, since we are plant strong? What does that mean, no coconut oil since you are “plant strong”? These are fantastic! Thanks for sharing. I sent them to my in laws for Christmas and they were very much enjoyed. I tried them…or really, I tried four (!) before sending them and looked forward to making them again. Tonight is the night! With snow on the way they seemed perfect, but I thought I’d share some variations I made… I didn’t want to use sugar since we are trying to avoid it, so I substituted date sugar (still used the maple syrup) also left out the chocolate (hard but true) and added a few more half pieces of toasted pecans. They are great, still!! I made my flour (thanks vitamix) using Isa’s recipe from her cookie cookbook. Do you ever cook with date sugar? Thanks for all the yummy recipes you share! Whoops! I forgot to add the sugar and … They turned out lovely and sweet enough! Thanks for another scrumptious recipe. My only other variation was deliberate: using pumpkin seeds instead of pecans due to nut allergies. I love that I can rely on your recipes and make them work for my family! next time I make them ill have to double the recipe!! Just made these with my daughters and we all gave them a big thumbs up! Adding this recipe to our other favorites from this season: Peanut “Better” Balls, Oat Squares with Chia Seed Jam, and that magnificent Best Shredded Kale Salad (E-V-E-R). Yours is the only site I’ve found where I’m confident enough to make a dish for company before I’ve tried it. You never disappoint! Keep rockin’ on. It is a shame that schools are all nut free these days, my daughter also loves them and they are a great mid day snack..
oh did I mention? Yum, yum, yum, yum, yum!! This is everything I love in a cookie! So good – thanks for the recipe! I could not get these to hold their shape at all! So I had to make them as a crumble and eat them with a bowl and spoon. They were AMAZING! Also great over ice cream. I just made these and hooooly cow. My house smells like Christmas and I’m looking for “broken” ones that need to be eaten. I skipped toasting the pecans and processing the oats, and I used the Bob’s AP GF flour, and they still turned out pretty great. Thanks for sharing this recipe! I can’t wait to bring these out at my Super Bowl party tomorrow. The husband: “Oh, mmm. These are good. Are they Vego Gluto Organo Fruity Something or Other?” Yes, my dear. The better to tempt you with! I used walnuts instead of pecans and made my own flour blend using the almonds and sweet rice I have on hand (1:1 almond flour to sweet rice flour). They are just scrumptious! Thank you! I just made these for my book club and they are fantastic. I used sunflower seeds instead of pecans because I needed them to be nut free and I used whole wheat flour because I didn’t need them to be gluten free. My kids will love these too! Thanks for another fabulous recipe. Loved the cookies…always trying to find great snack ideas with great ingredients for my 4 boys who are always looking for Oreos! Lol …I did not have any gluten free all purpose flour so i added some whole wheat flour, just had on hand,…did not have any dates…so I added a few raisins!! All I have to say or should I say all they had to say was these are awesome Mom! Thanks for the awesome reciepe!! Thank you for the awesome cookie recipe! I’m always looking for a good snack recipe for my 4 boys who are always looking for Oreos! Lol! I did not have gluten free flour on hand son I used whole wheat and no dates either so substituted raisins, which were awesome with the chips! Yum! Thanks for an amazing recipe! I just made these last night for the whole fam….everyone devoured them! I had run out of coconut sugar so I added 1/4 cup more maple syrup instead and they came out just devine!!! Thanks for this awesome recipe Angela!!! Holy crap those cookies are beyond delicious! Just eating the dough was amazing but once they were baked, the gooey chocolate morsels coating the pecans and oats was an unbelieveble party in my mouth. I love these! I’ve made them three times in the past three weeks. For the last batch I doubled the amount of dates and omitted the chocolate chips and I have to say I love them even more that way than with the chocolate. Perfect nutty crunch with tea. Thank you Angela! Just wanted to thank you a million times over for this magnificent recipe!!! I had a chocolate chip cookie craving, but the pact I made with myself is that I would have to make it from scratch. I did use regular AP flour and it still turned out great! I may try spelt next time. The toasted pecans really made a humongous difference; typically I get lazy and just put them in recipes raw and untested, but, boy, it was worth it to toast them! I just want you to know that my husband—a picky eater—told me to “keep this recipe because it is really good!” We both loved the dates, too. 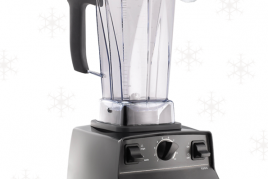 It is not as sweet as a raisin or cranberry, so it doesn’t overload the cookie’s flavor. Just an unbelievable cookie that I will be using this year for Christmas gifts. Hands down, the best cookie we’ve had to date! Thank you thank you thank you!!! If I vacuum packed these, do you think they would keep for a month or two at room temperature? The reason I ask is because I am going to be in Alberta in the field, sleeping in tents for 2 months, but they do not have many Vegan food options for someone in the military. Soooo, I will be making lots of snack foods to bring with me alongside my raw protein supplements! Thanks! I’ve been following your recipes for a while now & always enjoy them! Thank you so much for sharing such yumminess with us all, as these sure are tasty! I found it impossible to roll them into a ball as they were soooo sticky & crumbly though, so I baked them as one on a cookie sheet, then cut them into squares. Any thoughts around how to overcome this issue? Thanks again! Can’t wait to make these! They look mouthwatering! These are the best cookies ever, my 4 year old and I LOVE them. I actually couldn’t stop eating the dough and fully had these for breakfast the next day. I just made these with all purpose glutenfree flour (from SarahBakes Gluten Free Treats) and they came out superb! So yummy and Carmely. Thanks so much for this great recipe. It’s so inventive. These taste amazing and are easy to make. A truly unique cookie that anyone could enjoy. HIGHLY recommend. I used regular flour and they turned out great, in case anyone’s wondering! Hello! First off I love your cookbook! It’s amazing! I have a question…could I use noor dates instead of medjool dates? Do you know the difference? I accidentally picked up noor instead of medjool say Costco! Do you think this would work alright with light spelt flour? I love it! It’s so much easier to digest than all-purpose. The last week or so has been chilly here in St. Louis…although we’re back into the eighties for the weekend…anyway, my kids were wanting cookies to go with fresh apple cider and I was looking for something different from the usual oatmeal cookies we make and this was so tempting. I didn’t have all the ingredients on hand and the rain discouraged me from a trip to the market so I improvised. Used some sunflower seeds and pumpkin seeds in place of the pecans, added some chia and hemp seeds for fun, included a “flax egg” to be safe. I’m sure they aren’t as delicious as your gorgeous version but they have certainly been thoroughly enjoyed in our house. I can’t wait to follow the recipe to the letter. Thinking of making a version with a little cocoa powder and instant coffee crystals…mocha turtle cookies seem like a yummy idea to me! Loves it!!! I made it with quick rolled oats. Is that ok? Was it suppSe be regalur rolled oats ? Yes I always use regular rolled oats in my recipes, but glad it turned out anyways. I made these yesterday and omg, they are so good! I’ve always loved raisin oatmeal cookies, but these are definitely 1000x better; the mix of flavours is great (and turtles were my favourites as a child too ;)). I froze them and I have to agree that they are at their best cold! I just made these. Best cookie so far! Cookies and cream: your vegan turtles with coconut yogurt — heaven! These are seriously fool proof! I’ve made them 3 times and every single time minds were BLOWN! 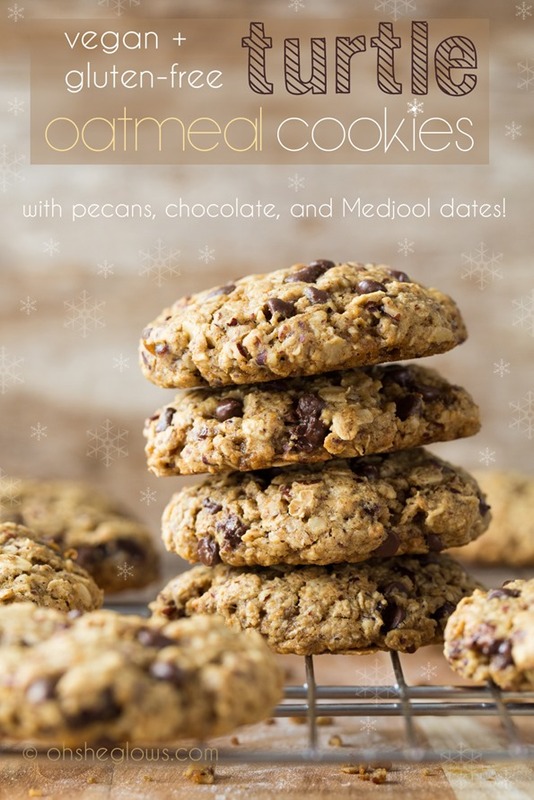 (one time I subbed almonds for pecans and it worked out great) It’s my go to cookie, and I plan on making a huge batch for holiday baking this year. They are so incredibly delicious. Amazing job on these Angela. Any subs to make without sugar? I subbed all-purpose flour with sprouted spelt flour and the cookies turned out amazing!!! They are soft, chewy and simply irresistible! Had some with Coconut Bliss ice cream, it was heaven on earth!!! Thank you for sharing the recipe!!!! This is the first recipe I made from this website and OMG!!! My very skeptical husband said I need to make these all the time. My three year old daughter smiled and ate happily when I gave her one of these cookies. These are my absolute favorite oatmeal cookie I’ve ever had. 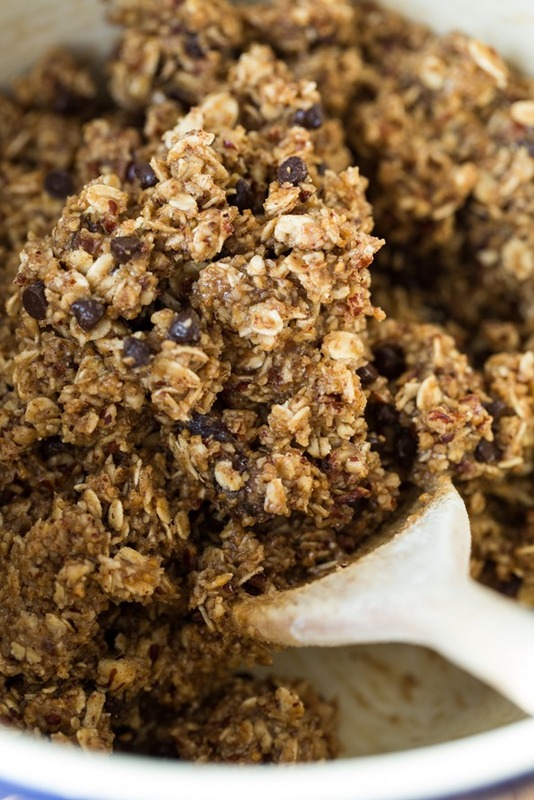 I will use this recipe whenever I need an oatmeal cookie! Would these work as well if I substitute walnuts for the pecans? I did that last night and they were great! Though I imagine pecans would make them even better. Wow, just made these and they are INCREDIBLE! So decadent. So addicting. They definitely don’t taste as wholesome as they are! I love the addition of dates, they are perfectly turtley! When I tasted the batter I thought they might be a bit too sweet for me, but through baking the sweetness mellowed out. also FYI I used regular all purpose flour and it worked great! And they turned out perfectly – love them. I threw in some extra chocolate chips (cause, why not?!) – I love these – they will be a new go-to comfort cookie. And I agree, they replace the basic oatmeal/raisin or oatmeal/chocolate cookie – the dates and pecans see to that! thanks for another keeper, Angela! All I can say is ‘Awesome’ vegan cookie recipe. Thank you for sharing. I modified the recipe because I didn’t want brown sugar in them. Instead of 1/2 cup brown sugar, I took 1/2 cup of puree dates and 1 tablespoon honey. Blend the dates with the wet ingredients and incorporate into dry ingredients. In lue of chopped dates, I put dry blueberries. Raisins, dried apricots or any dried fruit would work. These look delicious. I am wondering though if you would consider posting the nutritional information for your recipes with your posts (e.g. calories, proteins, fats, carbs etc)? I used coconut sugar and they turned out lovely. Can I use prunes instead of dates? made them. not a fan at all. Hey Claudia, So sorry to hear that you didn’t enjoy these! Can you let us know what went wrong? I made these cookies to give to my neighbor, a sweet but ailing older man who lives alone. He always knocks on my door when he notices I have a package on my doorstep that I haven’t retrieved (I always forget to check the mail), so I wanted to repay his neighborly kindness with a bit of my own. I know he’s going to love these! I was originally planning to make your jumbo chocolate chunk cookies today, but I couldn’t find arrowroot flour, so I ended up going with these instead. They turned out so perfectly moist, chewy, and delicious! Sweet but not cloyingly so. I followed the recipe as-written except that I added chopped up chunks of 54% dark chocolate instead of chocolate chips. This one’s a keeper! Love your cookbooks and blog! For the flour, is the measurement for after the flour is sifted? Or straight from the bag? Thank you so much and happy holidays! These are the best cookies I have ever made. We don’t have a food processor, so the oats went in whole and the pecans chopped. “Fantastic” is how my husband describes them. The directions say to preheat the oven to 325F but to bake at 350… I’m pretty sure I should bake at 350, but wanted to double check? What did everyone else bake at? WOW, my family adored these! We made them with regular (not GF) flour, coconut sugar and without dates because we wanted to eat these immediately after reading about them and that’s all we had on hand. Needless to say, they were divine. I think the only thing I’d change next time (oh yes, there will be a quickly approaching next time) is that I’d add less sugar/maple syrup if I were to include dates. I felt like these were already on my extreme scale of sweetness and I don’t think I could’ve handled the sugar content if dates were added. Just a heads up for those also a bit sensitive to sweetness! Thank you for all the wonderful recipes as always–they’re so enjoyed both by my family and home and by my friends on campus! Thank YOU for the great comment! So happy you’ve enjoyed the recipe. I made these today, and they were delicious. Thank you for the recipe! I started following your blog and trying recipes 3 years ago, and now nearly all the meals I make come from your books or blog. I’ve been vegan for over 10 years, but was never much of a vegan cook until I found this website! If you could please comment on why I could not get these to hold together. Every time I tried to roll them they crumbled so I put them in a smaller cookie sheet to bake them as bars. The batter was delicious, I made no substitutions so not certain what I did incorrectly. They are baking now – taking longer than if I had accomplished cookies. Also, is the oven temperature 325 or 350 degrees – both temperatures are listed on the recipe. Thank you so much for all you do and all of your delicious recipes!! Hi Cyd, I’m so sorry to hear you ran into problems! I’m not sure what might have been the cause; I haven’t encountered this issue with these cookies before. Is it possible somewhere along the line your ratio of dry ingredients to wet got thrown off accidentally? On the plus side, it sounds like you made the best of the situation with those cookie bars–yum! In terms of oven temps, the pecans should be toasted at 325, and then the cookies baked at 350. Hope that helps clarify! WOW!!! My kids and I love love love them! Thank you so much for sharing this gorgeous recipe! So glad I have found your website! I have a question please, havent found the answer in comments here. What is the best way to store these cookies to keep them fresh? Airtight container I guess? How long do you think they last until they go bad? I’m so happy you love the recipe, Kat. :) Yep, you got it! I’d recommend storing these cookies in an airtight container or zip bag in the fridge for a few days, or in the freezer in a freezer-safe, airtight container or zip bag for 2 to 4 weeks. Happy baking, Kat! Cookies are great! I doubledthe batch. Can you freeze the dough? Hey Erin, I haven’t personally tried freezing it yet, but if you do I would suggest freezing a single cookie portion. That way, if it doesn’t work out you won’t ruin the entire dough. Hope this helps! And please let me know if you end up trying it out. These were amazing! They are definitely near the very top of the list of my favourite cookies ever, vegan or not. Bonus: the dough is DELICIOUS and perfectly safe to eat! And they are decently healthy enough that I don’t feel guilty after eating one (or three lol). Just made these – lovely combination of flavours. I did make a few substitutions though. First, having made recipes from this site before I know that I don’t have as big a sweet tooth as Angela- I left out the sugar and I reduced the amount of maple syrup by half, and they were just right for me. I added a tablespoon extra of almond milk to make up for the reduction in liquid. I didn’t have any vanilla, so left that out. I think baking soda is the equivalent of bicarbonate of soda, but since there was no acid in the recipe to activate it I used baking powder instead. (Dunno what the north American equivalent of that is!) I might leave it out next time just to see if it’s really needed. Might put in more dates next time too. But there will be a next time! Thanks for the recipe! These cookies are wicked crazy delicious, Angela!! Knowing that our family loves Medjool Dates,, pecans, etc…, I went ahead and made a double batch! Definitely, NOT a mistake! That was a couple of weeks ago – tonight, I’m at it again. I have refrigerated this dough with great success. The dough is sticky to work with, so I put it in the fridge for 1/2 hour. It’s much more manageable to shape. Love your cookbooks and app, Angela. Thank you for sharing with us. Hey Denise, I love the way you think!! Double batch? Yes please! And thanks for the tip on chilling the dough for up to 4 days…that’s really helpful to know. And thanks for your sweet words about the cookbooks and app…it means the world to me. Granted, I used pastry flour, which was all we had in the house. Wonder if that was the source of my problems. Made these last night with my 16 yo daughter who tricked them out even more. She made a chocolate drizzle out of enjoy life chips & coconut oil and caramel drizzle out of coconut sugar, almond milk and coconut oil. Oh my word they are so good!! This is an awesome recipe. We couldn’t stop ourselves from devouring the dough either. We will be making these many more times to come! Thanks for the perfect healthy cookie that tastes sinful. Hey Nicole, I’m so happy you enjoyed these! I’m making them this week and can’t wait. I love the caramel drizzle…omg! Just made these for a cookie swap. They are delicious!! The only thing was that I had to add a little more maple syrup to help them stick together before baking. But they came out great!! Thanks Karen! I’m so happy they were a hit. I made them the other day with walnuts..really good. Angela, I make these for presents, put them in a pretty can and people always offer the cans back and ask for refills. They’re the best cookies ever, and to be honest, I have them for breakfast as well. I sub maple syrup sometimes for rice syrup if its not in the pantry, or dark brown sugar for light but I pretty much stick to your recipe. It. Is. Fabulous. Thank you! Hey Tess, This is such a great idea! What lucky friends you have. :) I love that you can swap out the sugars and it still works too. The nutty base in the cookie dough is just fabulous isn’t it? I’ve made these with walnuts instead of pecans and it works too. I’m just wondering: why do we preheat the oven only to 325º if we are to bake the cookies at 350º? Do you suggest turning the temperature up once the cookies are in the oven? The 325F is for toasting the nuts. :) I will insert a line in the directions to mention to increase the heat to 350F after toasting the nuts! These are amazing. Making them again since we ran out this morning. Really a great breakfast cookie! They taste like the ol Dad’s cookie I used to eat as a kid. So happy to hear that Nicole! I used to LOVE those Dad’s cookies! I just made this and they are my favourite of all your cookies! I used regular flour and an ice-cream scoop before flattening. So yummy thank you so much! I’m so glad you love these Danae…thank you! I found this recipe bookmarked on my phone back from who knows when and made them today. They were so good! These should be up on your app. A little on the sweet side for me but so Delicious! I doubled the recipe and made these with all purpose flour and regular oats. I also ran out of maple syrup so I had to use 1/2 cup maple and 1/2 cup agave. The cookie dough was a little tricky at first but as it sat for a few minutes it became more cohesive. After tasting the dough it was very sweet so I omitted the dates and put very few chocolate chips. I used a small cookie scoop so I didn’t have to get my hands too sticky. Will make again. Thank you so much Angela for sharing a wonderful recipe! 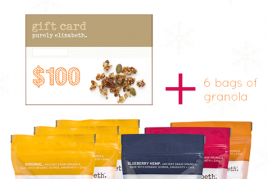 Previous post: Giveaway: $100 gift card + 6 bags of Purely Elizabeth Granola!